As I read it, it occurred to me that data visualizations are “everyday things” now, too. Even richly interactive ones viewed on tablets and phones. That has only become the case in the past half-decade or so. Yes, examples can be traced back to the early days of the internet, but the recent explosion of data, software tools and programming libraries has caused their proliferation. And I found that point after point, principle after principle in Norman’s book applied directly to data visualization. I’d like to call out five points that struck me as particularly relevant to recent discussions in the field of data visualization. Regarding doors, Vox published a great video on a particularly poorly designed door on the 10th floor of the Vox Media office. The video references and even includes interview footage with Don Norman himself. And it’s funny. You should watch it. What does that have to do with data visualization? We often use similar controls – radio buttons, combo boxes, sliders, etc – to filter and highlight the marks in the view. 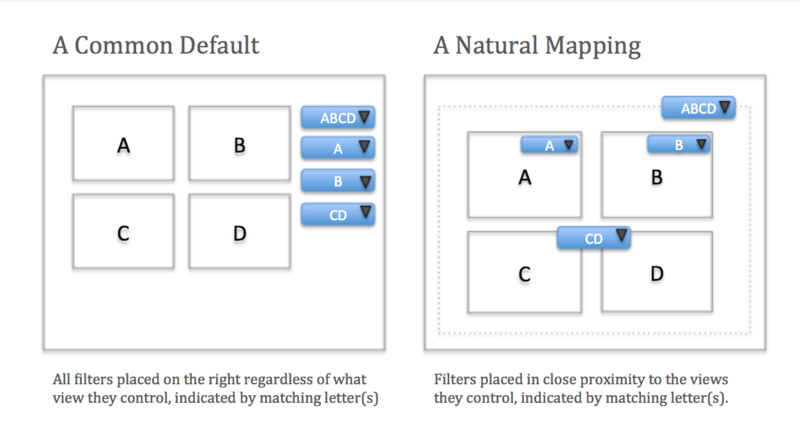 When there are multiple views in a visualization (a dashboard), there is a similar opportunity to provide clear, or natural, mappings. This is a relatively straightforward example, and the job of the designer of a more complex visualization is to make it similarly clear what can be done and how to do it. 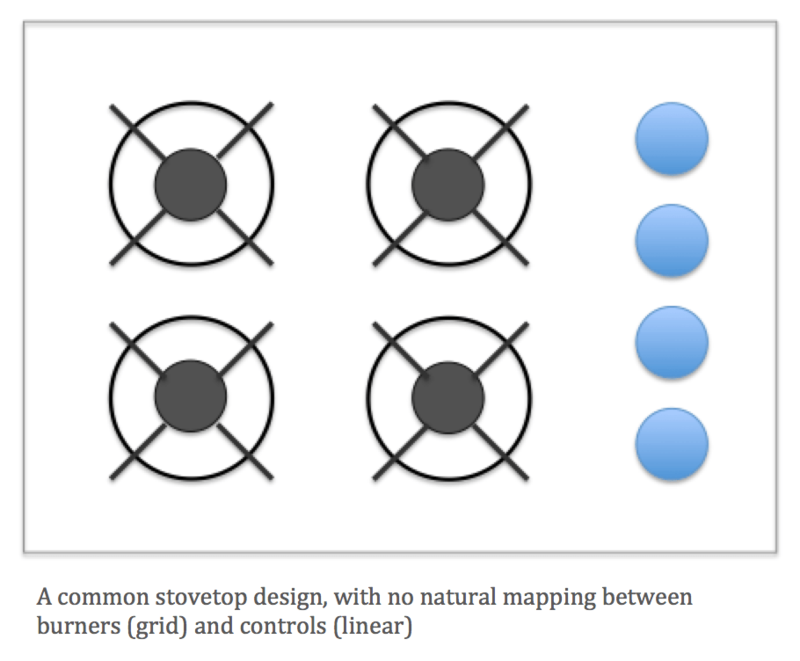 Designers use things like affordances, signifiers, constraints and mappings to make it obvious. Note that it takes a lot of effort to make the complex obvious. Norman differentiates between two types of errors: slips and mistakes. Both types of errors happen when people interact with data visualizations. In the world of mobile, slips are so common – Maybe I meant to tap that small icon at the edge of my phone screen, but the phone and app recognized a tap of an adjacent icon instead. How to make sure your readers avoid slips and mistakes? Build and test. Iterate. Watch people interact with your visualization. When they screw up, don’t blame them or step in and explain what they did wrong and why they should’ve known better. Write it down and go back to the drawing board. If the person who agreed to test your visualization made that error, don’t you think many more likely will? And you won’t be there to tell them all what they did wrong. Your only chance to fix the error is to prevent it. How can an experience with a data visualization be pleasurable? In lots of ways. It can make it easy to understand something interesting or important about our world, it can employ good design techniques and artistic elements, it can surprise us with a clever or funny metaphor, or some combination of these and more. 4. Complexity is good. Confusion is bad. There’s a trend in our field to move away from the big, complex dashboards of 2010 and toward “light-weight” and uber-simple individual graphs, and even GIFs. Why? A big part of the reason is that they work better on mobile. It’s true, and what we’ve learned in the past few years is that the complexity of those big dashboards isn’t always necessary. This is a great development, and I’m all for it, but let’s just remember that there was often a great value to the rich interaction that is still possible on a larger screen. Instead of abandoning rich interactivity altogether, I believe we should be looking for new and innovative ways to give these advanced capabilities to readers on smaller devices. When those capabilities will help us achieve some goal, we’ll be good to go. We’re not there yet. After all, it’s not the complexity of the detailed, filterable dashboard that’s the problem on the phone – it’s that we haven’t figured out how to give these capabilities to a reader using a phone yet, and the experience is confusing. Does this make sense to you? I have to be honest. This one is my hot button. There’s a school of thought that says that the visualization type that gives the reader the ability to guess the true proportions of the thing visualized with the greatest accuracy is the only one that can be used. Some go so far as to declare it immoral to chose a visualization type that introduces any greater error than another (they all have some error). The problem with this line of reasoning is that absolute precision isn’t always necessary for the task at hand. He uses the example of converting temperature from Celcius to Farenheit. If all you need to do is figure out if you need to wear a sweater when you go outside, a shortcut approximate conversion equation is GOOD ENOUGH. It doesn’t matter whether it’s 52, 55, 55.8, or 55.806. In all four cases, you’re wearing a light sweater. And let me repeat the point: there are errors associated with every visualization type – we aren’t machines and perfect decoders of pixels or ink. Sometimes it’s okay that a general understanding is achieved. I hope this was helpful for you! I love doing this kind of thing – pulling lessons from other amazing writings and seeing how they apply to data visualization, which I see as the “catch-all” discipline. It’s part numeric, part editorial, part graphic. To do it well, we need to embrace the principles of good design. I’ve tried to outline a few here from a true expert who we should all be familiar with. If you do read Norman’s book, you’ll find that there are many more. Many thanks to my colleague Jewel Loree for pointing me to this book way back when. I finally got around to reading it, and am glad I did. on #5: agreed! 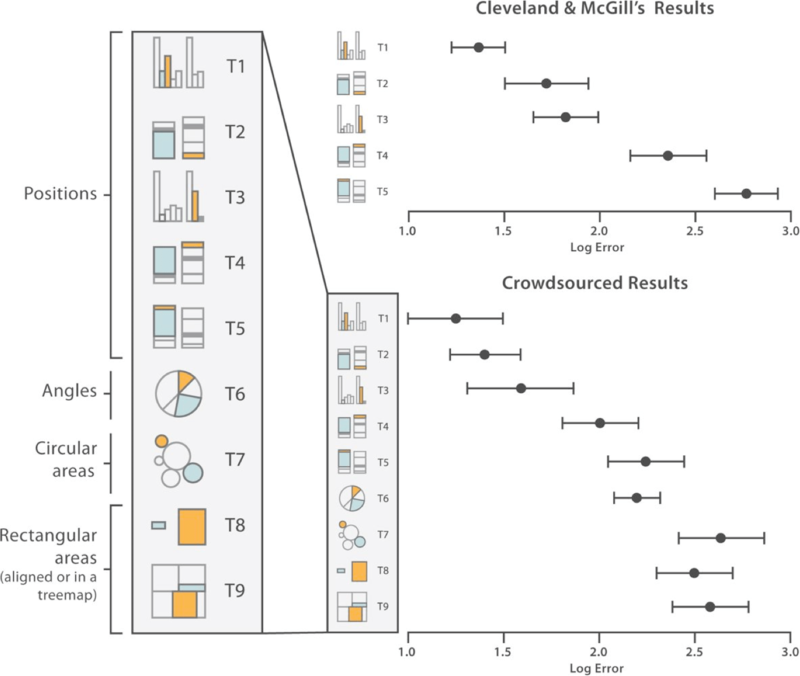 I actually propose using less “precise” visualization methods for displaying less precise data. Thus a bar chart (very precise) might be a really poor way to show data with a lot of uncertainty. Interesting thought. Why show precision if the data doesn’t warrant it? I suppose another way to handle this mismatch in certainty of data and precision of visualization is to include error bars or some other such indicator. Thanks for commenting Anthony. Thanks for your comments. On point number 5, a well designed graphic will not lie, as in lie with statistics. Somewhere I heard that BF Skinner avoided the use of statistical analysis in his study of rat behavior because if the result wasn’t immediately obvious in looking at the bar charted result then he wasn’t interested. Great article and really made me think about how I’m designing vizzes. I particularly like how you laid out the filters in section 1. I think this is often overlooked by people, including me. I often try to get them out of the way, and clearly that’s not what I should always be doing. Thanks for writing this summary!